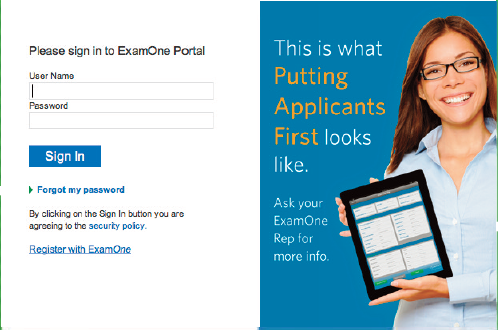 As we continue to refine our processes in 2014, we are introducing our new online ordering site, the ExamOne Portal. This new platform combines our suite of services into one Portal. The user-friendly portal gives you a single, easy-to-use and consistent interface across all lines of services, to include paramedical examinations, laboratory testing, data services, APSs, and our electronic data collection services. You will have the ability to order, track and retrieve results across multiple product lines with one user logon. ExamOne’s web-based service has been designed to simplify the life insurance underwriting process for applicants, brokers, agents, agencies, carriers, paramedical examiners, ExamOne field offices and various internal support teams. Not only are the applicants gaining from our new portal, all parties involved in the application process will benefit from this new interface. Our first user group transitioned to the new Portal the first week of May and migration will continue in phases. Be on the lookout for future communication regarding your transition date. If you have any questions, feel free to reach out to your local ExamOne representative. Previous post: Come meet the ExamOne MVPs at AHOU!